How often do you wash your hands with soap or liquid handwash? We all know that we should wash our hands before and after meals, after using the washroom, after playing, after touching pets and before going to bed. You should ideally wash your hands under running water with soap for at least 15 seconds each time. Make sure that you wash both sides of the hands and also the fingernails. If you do not wash your hands often, you will get sick more often because germs can live well on your hands if left unwashed. 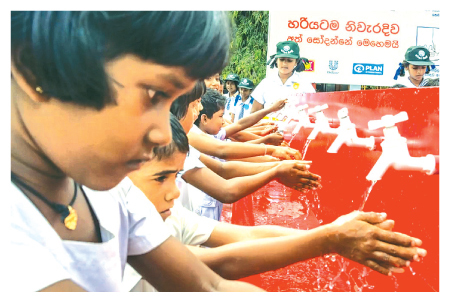 Today, October 15, is Global Handwashing Day. This is a good day to form a habit out of washing your hands. The Handwashing Day was founded by the Global Handwashing Partnership in 2008 and is now recognized by the United Nations. The first Global Handwashing Day was held that year when over 120 million children around the world washed their hands with soap in more than 70 countries. Since 2008, community and national leaders have used Global Handwashing Day to spread the word about handwashing, build sinks and taps, and demonstrate the value of clean hands. Each year, over 200 million people are involved in celebrations in over 100 countries including Sri Lanka. The 2017 Global Handwashing Day theme is “Our hands, our future!” This theme reminds us that handwashing protects our own health, but also allows us to build our own futures, as well as those of our communities, and the world. Handwashing is an affordable, effective way to achieve these goals. Ask your teachers to spread the message about handwashing in school. If you are in a hurry and there is no water around, carry a hand sanitizer that does not need water. Thinking of the future, we strive for continued health, well-being, and productivity for ourselves, our families, and our communities. For example, handwashing with soap could prevent many of the 272 million yearly schooldays lost to diarrhoeal disease, and 50 percent of common infections. The spread of bacterial eye infections, such as trachoma, can be reduced through regular handwashing. You can lower your chances of developing a lung illness by washing hands. The germs that cause respiratory diseases are commonly found on work surfaces and hands. Handwashing with soap or liquid handwash has the power to improve access to education for children and protect the health of patients and communities. Even the poorest families can afford to buy a bar of soap, so cost is generally not an issue. Some low priced detergents and cleaners can also be dissolved to make soapy water. Liquid handwash containers are somewhat expensive at first, but thereafter you can buy refill packets which are much more affordable and long lasting. Today, whether you are celebrating the Global Handwashing Day at school, at home, in a health facility, or with your neighbours and community, let us wash our hands and invest in a better future.